"Unusual Tales", a series presenting Steve Ditko's comics from 1957 to 1959 that are in the public domain. 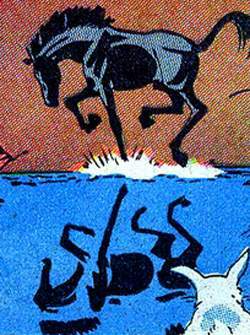 From Charlton's BLACK FURY #18  comes the 3-page "Pursued", one of many ebony equine stories Ditko did that year. This time, Black Fury is being hunted by a pack of wolves, led by Lobo. Some nice visuals in this one, I especially like that final panel. This is one of a handful of stories from the era that Ditko signed with the anagrammatic "J. Kodti" (sometimes "J. Kotdi") in early 1959.